The Science Daily news article reported, “the mortality rate for non-vegetarians is almost 20 percent higher than for vegetarians”. If you look at the actual numbers in the study though, the mortality rates per 1000 person-years for non-vegetarians was 6.66 whereas for vegetarians it was 5.56. While the statistical difference does equal 20%, in relative terms that equates to approximately one extra person dying each year from eating a non-vegetarian diet. The difference does not seem as dramatic when you look at it from that perspective does it?! So, does this give us the green light to eat meat… until the cows come home? While the media’s reporting of the stats does make the findings sound somewhat alarmist, it is always important to look at the big picture and when possible, to look at the body of research and not just one study. Over the years, many studies have shown that vegetarian diets are associated with reductions in risk for chronic diseases. It is more difficult however to pin-point what makes vegetarians healthier, as vegetarians also tend to drink less alcohol, to smoke less, to exercise more and to be thinner. People often think of vegetarianism as a lack of eating meat. 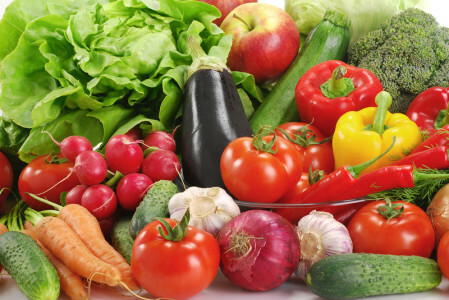 However compared to non-vegetarians, vegetarians eat a considerable amount of legumes, fruits and vegetables all which have a superabundance of nutrients that help keep our cells working to their maximum potential. On the other hand, this study did clearly show, how extremely resource intensive it is to produce meat. Vegetarian diets produce a third less greenhouse gas emissions (GHGE) compared to non-vegetarian diets. Beef is by far the largest culprit, as cattle farming produces 10 times more GHGE then any other livestock production. So go ahead, add another serving of veggies to your plate, however share that steak with a friend. Better yet, choose a chicken or veggie burger. You will have helped to reduce your GHGE as well as made a healthy choice.